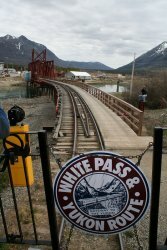 After many years of work, including the expenditure of over $8,000,000 to upgrade the rail line between the White Pass summit and Carcross, daily through service from Carcross to Skagway is now a reality. This service was ultimately made possible by an agreement between the WP&YR and Holland America, who will now be transferring their cruisetour passengers between the two communities entirely by rail instead of motorcoach to Fraser and rail from that point. 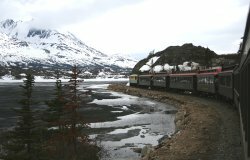 As many of you will know, the White Pass & Yukon Route is already considered by railfans to be one of the top 10 rail excursions on earth. It has also been the top-selling cruise ship excursion in Alaska for most of the last century, and this new service should ensure that people from around the world continue to come north to see what we have to offer. 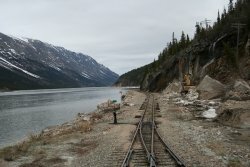 You can see many more photos of this line on our Carcross-Bennett (southbound) and Skagway - Bennett photo albums. 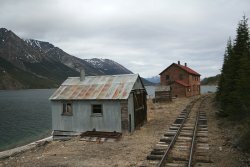 Carcross has always been a rail town. Even during the years when we had no scheduled service, it was still physically a rail town, with the tracks running through the centre of town. The inauguration party on May 25, 2007, was attended by a large number of people, including government and tourism industry representatives, and local residents. Despite a few toots from the locomotive's horn, the speeches and dancing went a little longer than planned, but we headed south on our great adventure just a few minutes after 11:00. 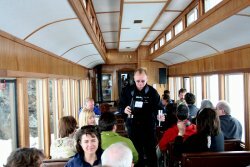 There were 7 passenger cars on the train, 3 for Holland America passengers and 4 for inauguration guests. Although this was called the "inaugural run" for promotional purposes, this actually wasn't the first run of the service - that happened 2 days ago. 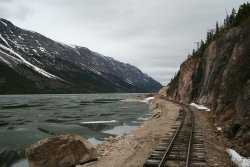 From Carcross to Skagway is 67.5 miles along the rail line. Looking across Lake Bennett towards the glaciers along the West Arm from about Mile 64. Standing between the cars is allowed, and folks on this trip were great about sharing that limited space. The weather report was for clear skies and 72 degrees - that wasn't even close to what we got, but the mirror-calm lake more than made up for the lack of blue skies. A strong wind yesterday blew the last of the ice off the lower few miles of the lake. Pennington Station at Mile 51.6 - it's no longer used, but every since I first saw this place I've imagined it as a B&B. Looking north along Lake Bennett at about Mile 47. It was in this area that the largest blast during the construction of the line was set off in 1900. Looking north along Lake Bennett from about Mile 43. As you see, yesterday's wind didn't blow the ice off the southern end of the lake. There is some very impressive rock work going on at Mile 41, which is the north end of the Bennett yard. 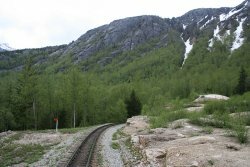 After a few days in the peaceful wilderness, it will be quite a shock for hikers to come off the Chilkoot Trail as a train arrives at Bennett! A 2-hour stop is made at Bennett. 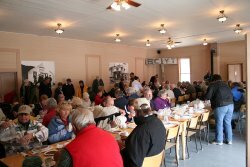 This allows time to enjoy an excellent lunch consisting of beef stew and baked beans, with apple pie for dessert. The sign in the background was on Boundary Island to mark the BC-Yukon border for many years - it was replaced by a new sign in about 1995. 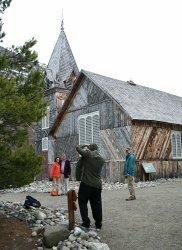 The historic church at Bennett is a popular spot for "I was there" type photos. Here Yukon Member of Parliament Larry Bagnell and his fiancee Melissa take their turn. There was still a fair bit of snow on the ground at Bennett, which limited the walking options somewhat. 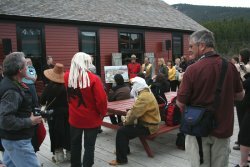 Parks Canada is to be commended for the number of enthusiastic rangers who were available to answer questions throughout the park. The view along Bernard Lake at about Mile 30. Climbing a steep grade just south of the Thompson River bridge, at about Mile 25. Michael Brandt, Vice-President of Marketing & Planning for the WP&YR, serves champagne for a special toast at the Summit before crossing into Alaska. 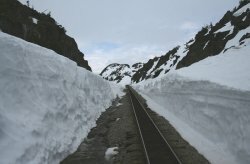 Snow drifts in some of the tight slots through the White Pass can reach depths of 50 feet or more, and clearing the line each April is a massive job. 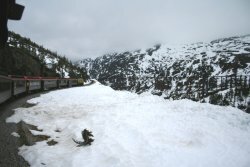 There is still over 8 feet of snow in this section just south of White Pass Summit at about Mile 20. Though no longer in use, the historic steel cantilever bridge (Bridge 18A) is world famous among railfans and engineers. The most dramatic section of the entire WP&YR line is surely the one between Tunnel Mountain and Slippery Rock. It's hard to imagine how in just a few minutes you could be on the rail line seen far below directly ahead. 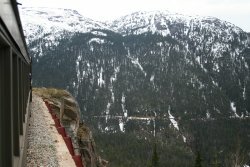 Approaching sea level at Skagway, the season suddenly changes from Winter to Spring. 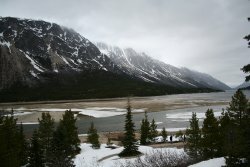 The smell of the budding trees captivated many of the Yukoners who hadn't seen a green leaf for many months. Upon reaching Skagway, we were given an hour and a half to see the town, and then were taken by bus to Jewell Gardens for a very special evening. They have a gourmet chef this year, and we had a superb dinner of herbed halibut on a bed of mashed garlic potatoes. 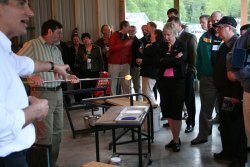 Also new this year is a glassblowing studio, and we were treated to a demonstration of that art form. Patrick Rouble, the MLA for the Carcross area, was invited to work with the artist to blow a gorgeous ball that will be sent to him when it cools - the photo shows an early stage of that process. 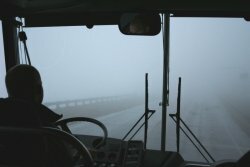 The motorcoach ride back to Carcross was quite subdued - it had been a long exciting day. Going through the White Pass at 11:25 p.m., we were up in the clouds for a few minutes - Mother Nature had been kind to us all day, and this was a reminder of what coastal mountain weather can be like. 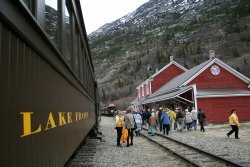 For both cruise passengers and independent travellers, the Skagway-Carcross-Skagway (or vice versa) journey by rail and bus offers an opportunity to see a remarkable variety of scenery in a single day. As well as the Holland America transfers, other operators have joined with the WP&YR to market the trip. 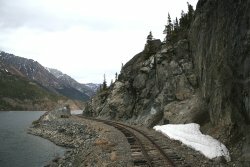 The first was Chilkoot Tours from Skagway, but the options are expanding rapidly. 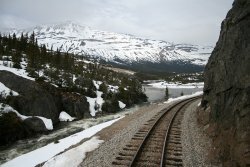 To see what the bus portion of the journey looks like, see the South Klondike Highway guide at ExploreNorth.